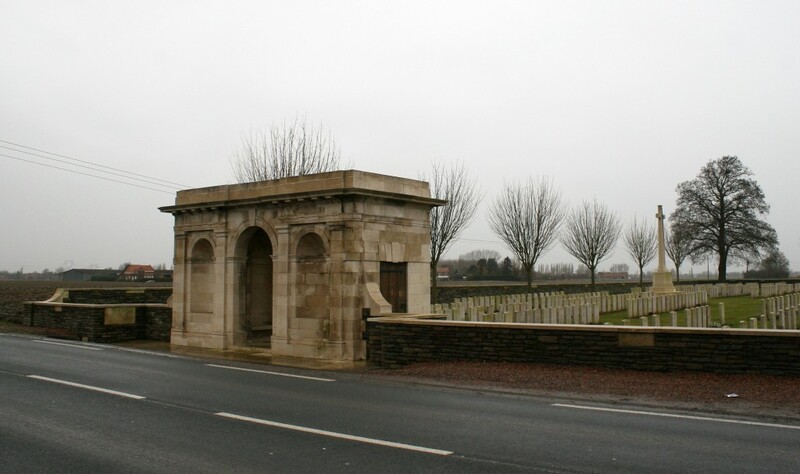 …by far the largest of the cemeteries we shall visit on this tour, and one of six cemeteries where we shall pay our respects in and around the town of La Chapelle-d’Armentières, not much more than a mile south east of Armentières itself. 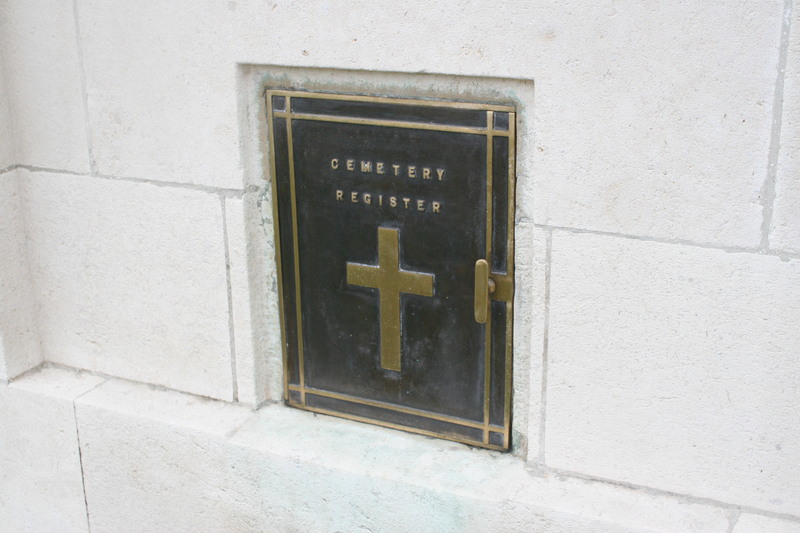 A reminder to sign the visitor book should you visit any CWGC cemetery. 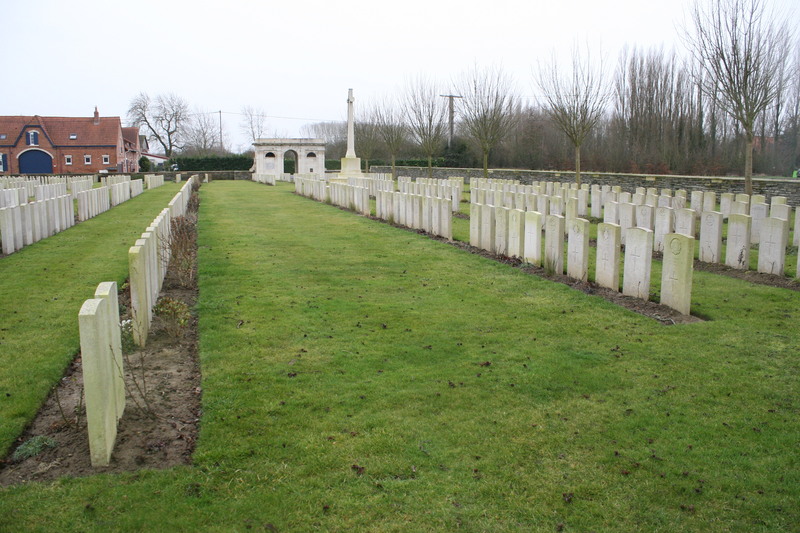 Originally there were two military cemeteries here, on either side of the road, but after the war the 73 graves in the smaller of the two, Ration Farm Old Military Cemetery, were all moved across the road and can now be found in Plot VI, where we shall pay our respects later. 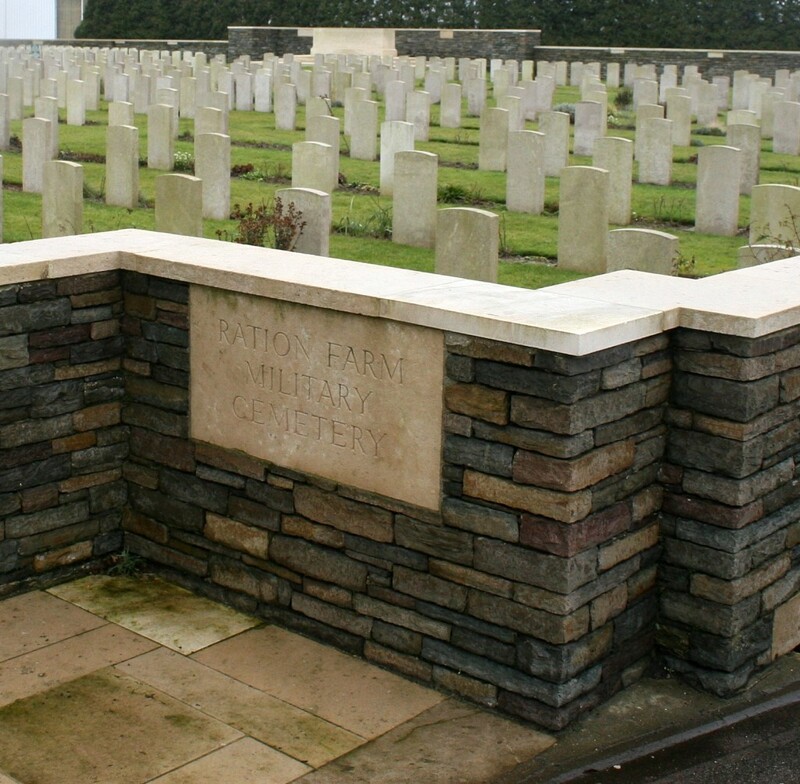 Immediately on entering, the first plot we encounter is Plot VII, some of the headstones of which are visible in the photo above. Plot I. 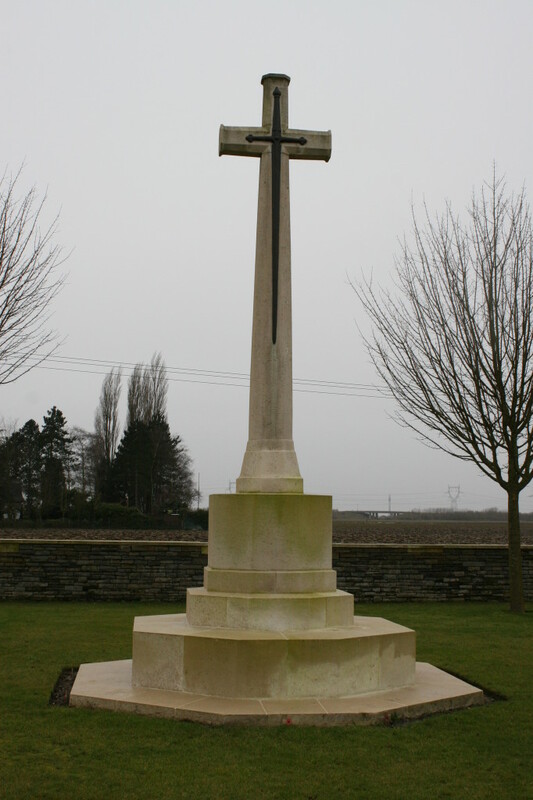 Without further ado, here, courtesy of the CWGC, is the cemetery plan. 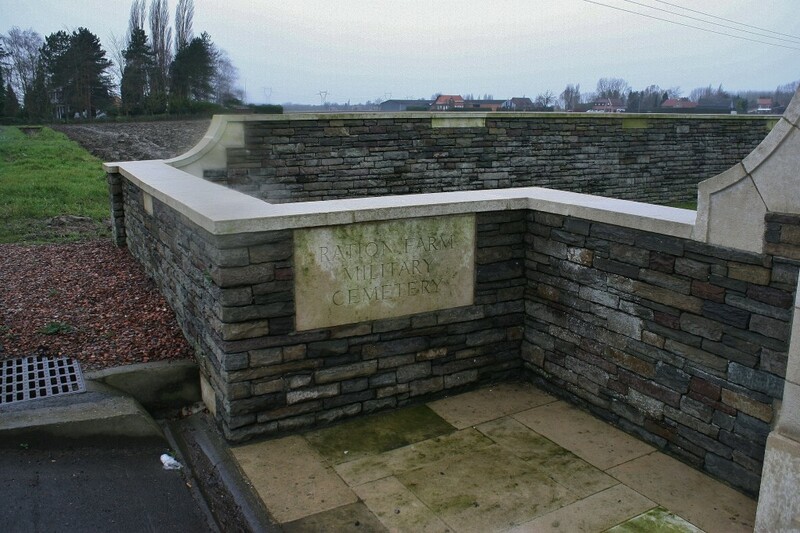 And a trench map. Four cemeteries are marked on it; White City Cemetery in pink, the two Bois-Grenier cemeteries in yellow and blue, and Ration Farm Military Cemetery in green. 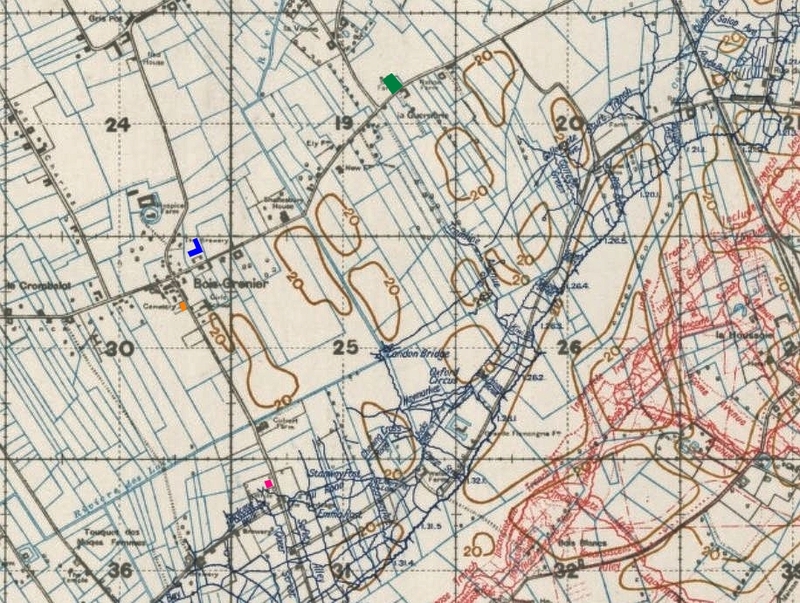 You’ll often see it mentioned that the Ration Farm cemeteries grew up at the end of a communication trench, but this 1917 map no longer shows any signs of one that I can see. 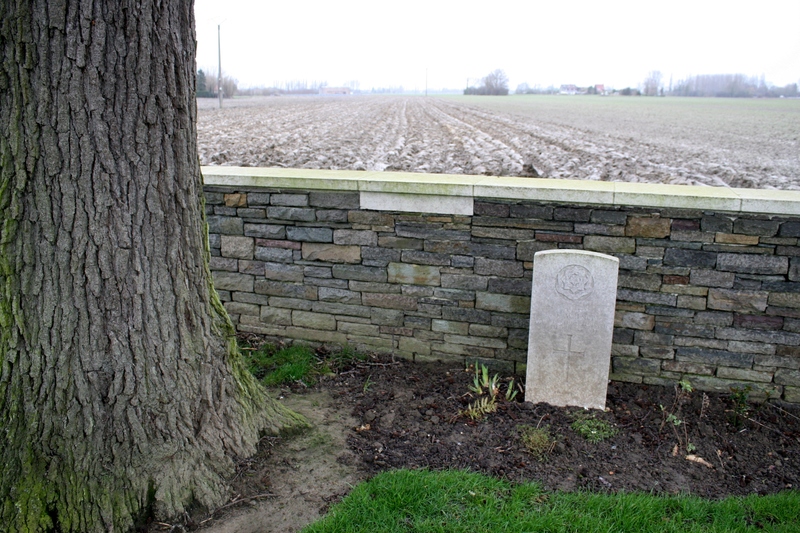 The grave of a single German (one of four German burials in this cemetery) killed in 1917, with Plot I beyond. The cemetery, originally, as you may have guessed, known as Ration Farm New Military Cemetery, was begun in October 1915 and continued in use, with the occasional gap, until mid-October 1918. 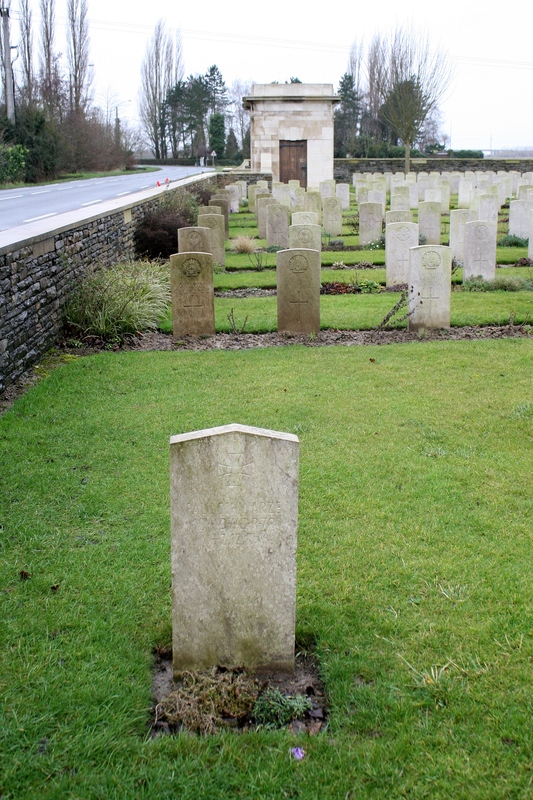 After the war it was greatly increased in size when men were brought in from isolated battlefield graves and from several small nearby cemeteries. 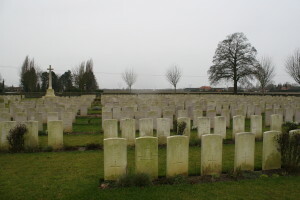 Looking north west across the cemetery from the south east corner, the German grave in the left foreground. 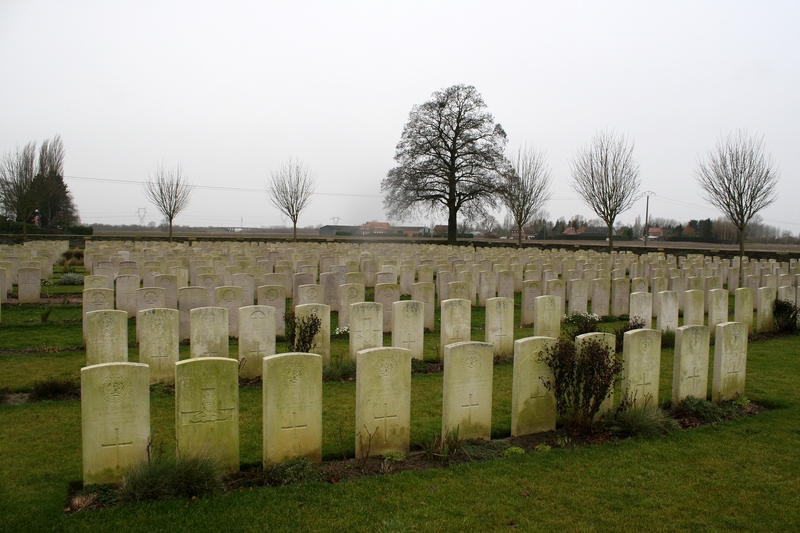 Most of the original burials are to be found in the plots nearest the camera in this shot. 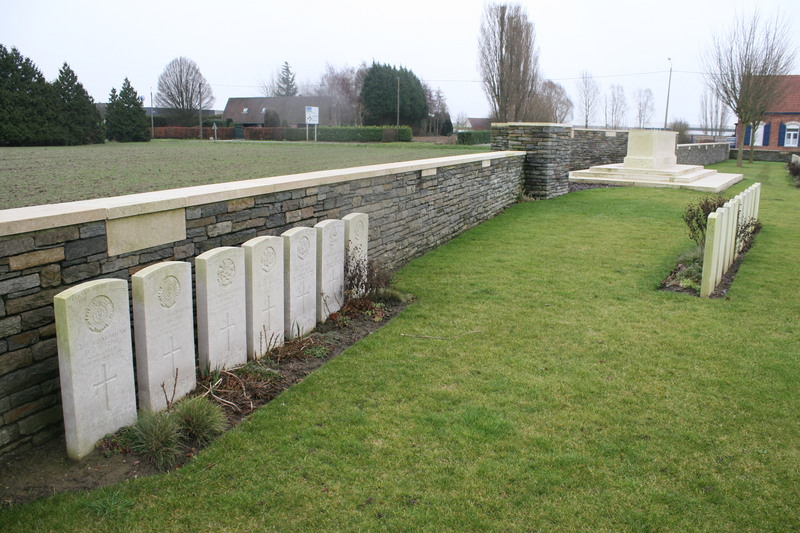 …and east to the Stone of Remembrance, Plot VI now on the left, and Plots III (nearest three rows to the camera) and V (furthest three rows from the camera) on the right. 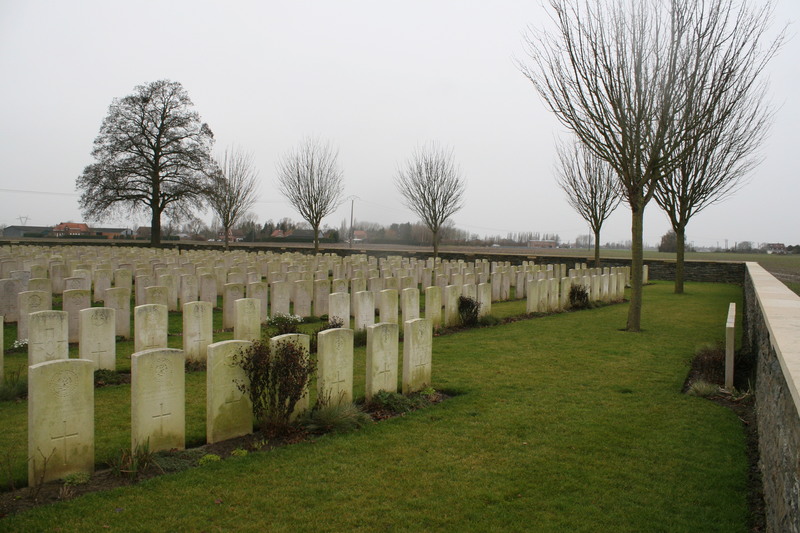 …where more than one hundred of the graves are unidentified. 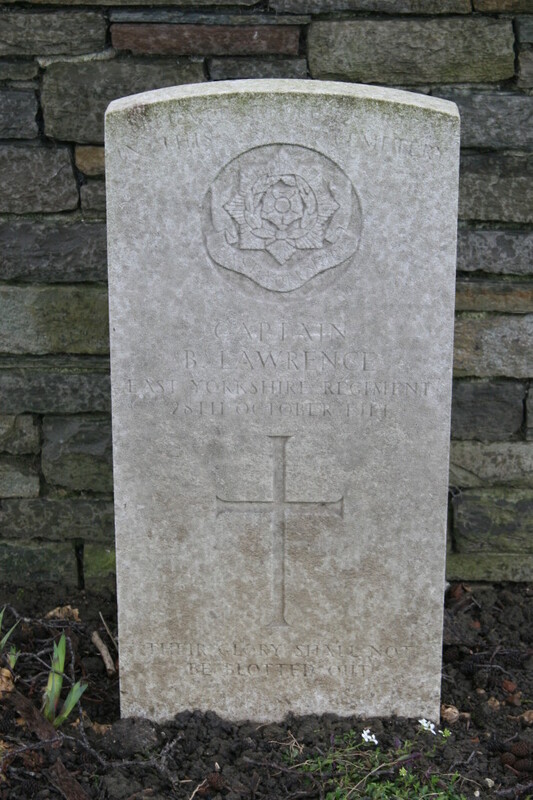 …including this one, to Captain Bertram Lawrence of the East Yorkshire Regiment, killed in October 1914, in the north west corner ‘near Plot VIII’, according to the CWGC Casualty Details List. 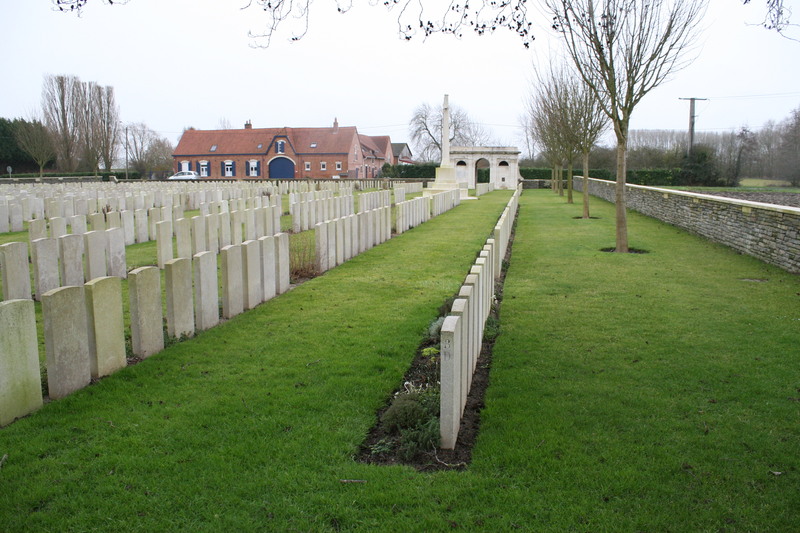 Looking south down the western boundary of the cemetery towards the cemetery entrance in the distance, Plot VIII nearest the camera. Panorama from the north west corner. 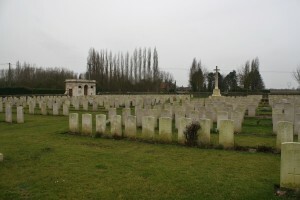 Looking from north to south down the cemetery, the four rows of Plot VIII on the right, and Plot VI Row A on the left. …from the north east corner of the cemetery. 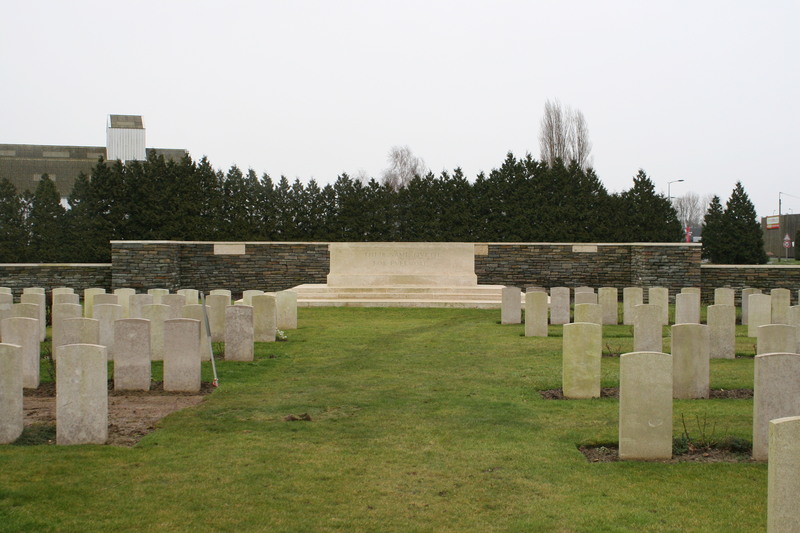 Argyll & Sutherland Highlanders in Plot VI, with some of the 259 Australians buried here in the rows behind. 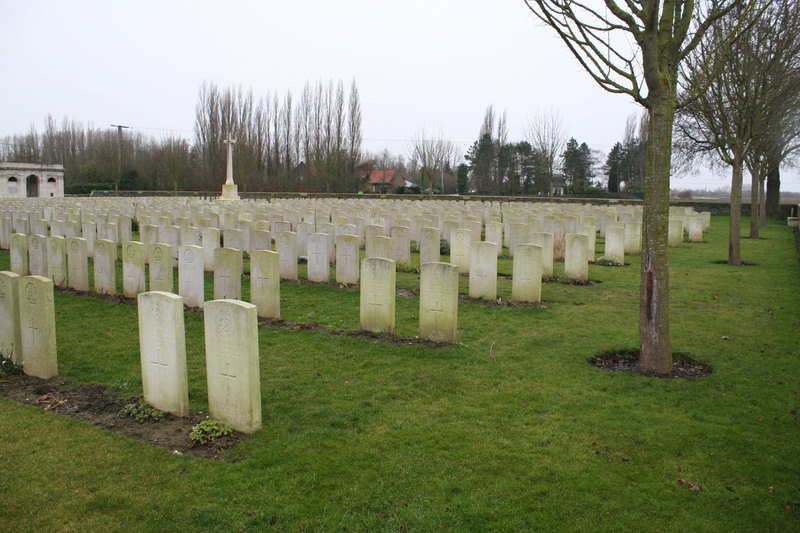 Nearly fifty of these Australians lost their lives in the attack on Fromelles on 19th July 1916 (we shall be touring the Fromelles area in 2016), were originally buried in individual graves on the battlefield, and then moved here post-war. 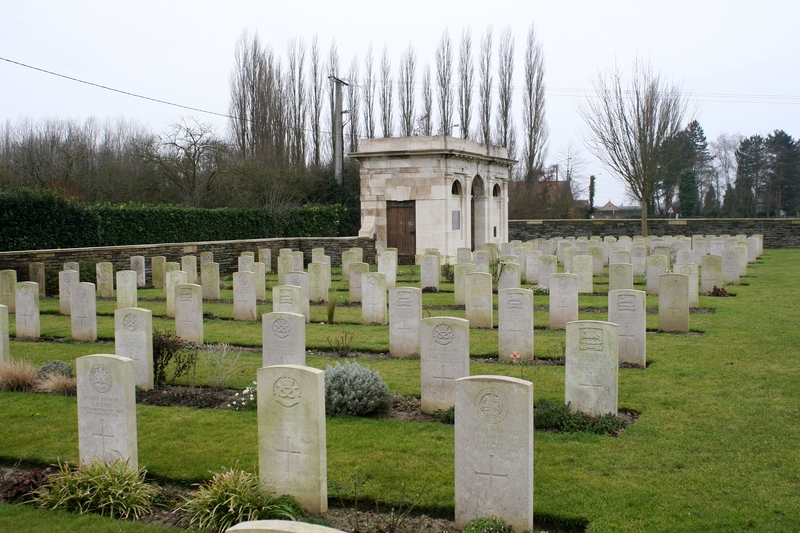 Above & below: Seven more special memorials to men ‘believed to be buried in this cemetery’. 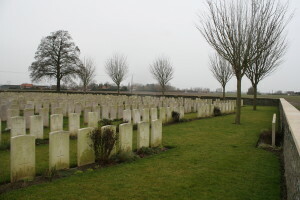 Views looking from south west (above left) to north west (below right) across the cemetery from the eastern boundary. All enlarge if you click ’em. 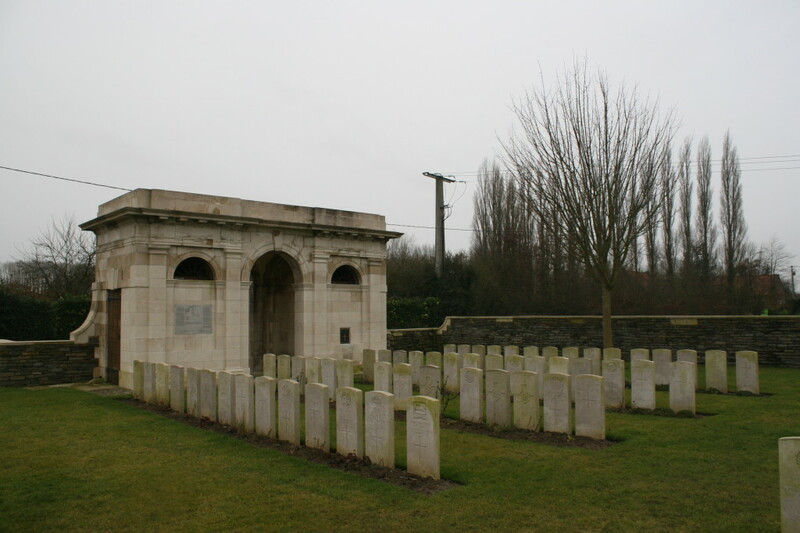 As is so often the case with cemeteries that were greatly increased in size after the war, of the more than 1300 men who now lie in here, more than half are unidentified. Time to move on. 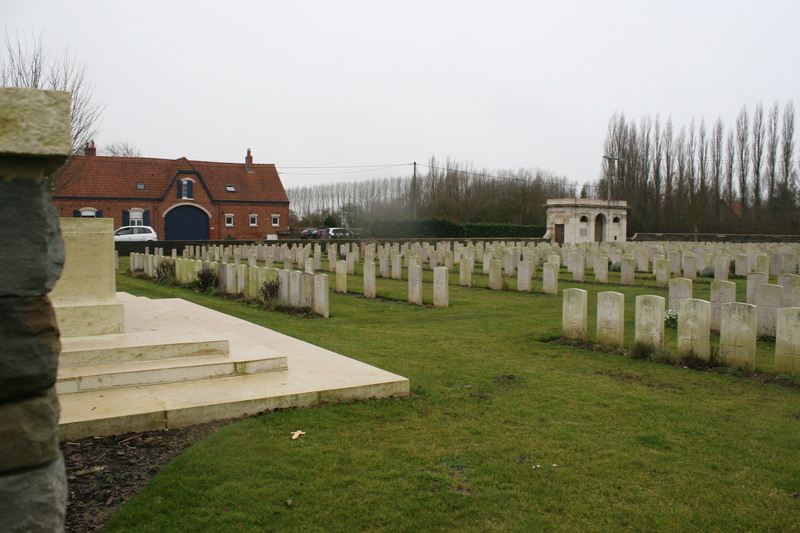 Next stop, the much smaller Desplanque Farm Cemetery. 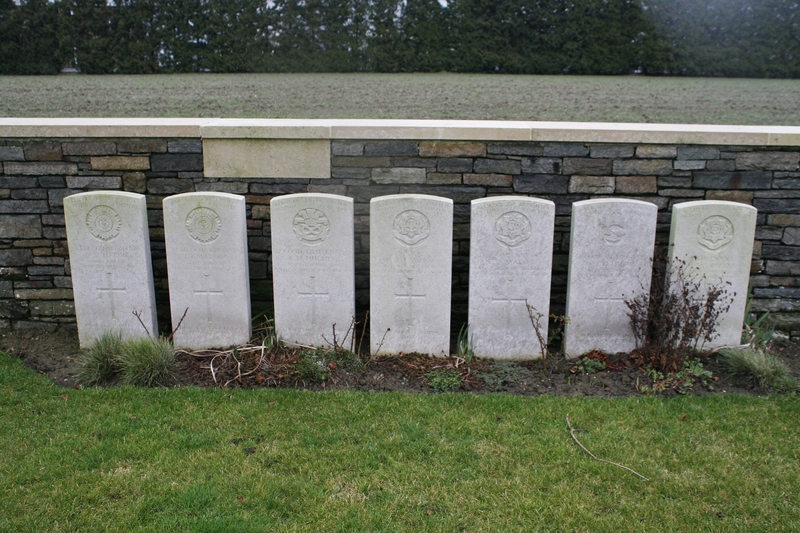 The other three German graves are visible in two of the above pics if you look carefully; two in the photo three after the trench map (next to each other near the Cross), and one in the photo three from the end, fifth row. I have also added a few words to mention them. Cheers Chris. 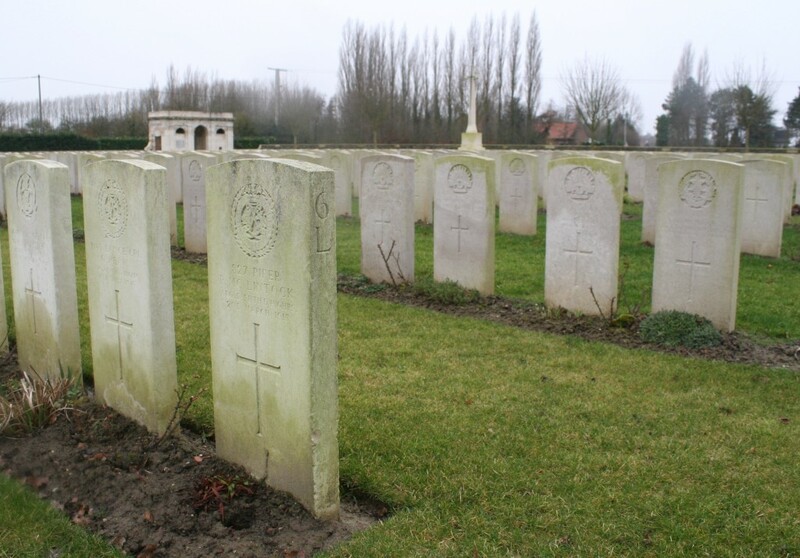 I visited Ration farm 20.04 2018 to see my grandfathers grave, Private Samuel Martin of the South Staffs Regiment, he is buried with two of his comrades from the same regiment. 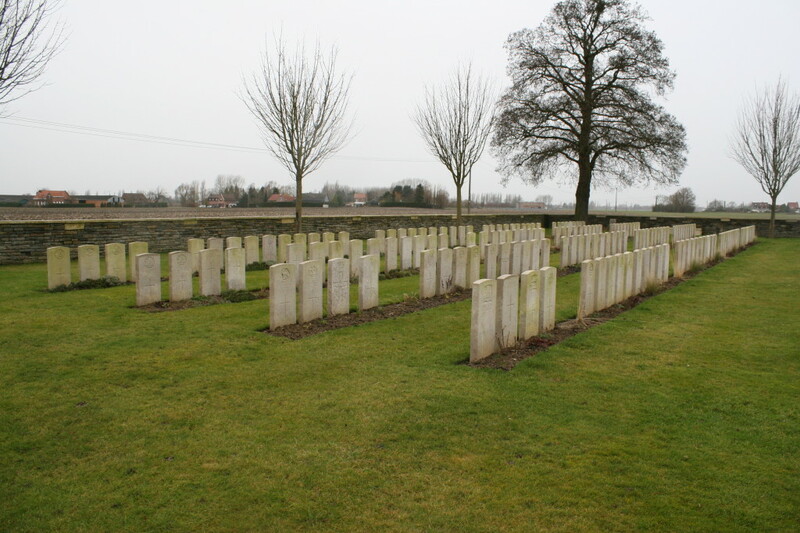 The weather was hot and sunny, the headstones had obviously been cleaned and in perfect condition. 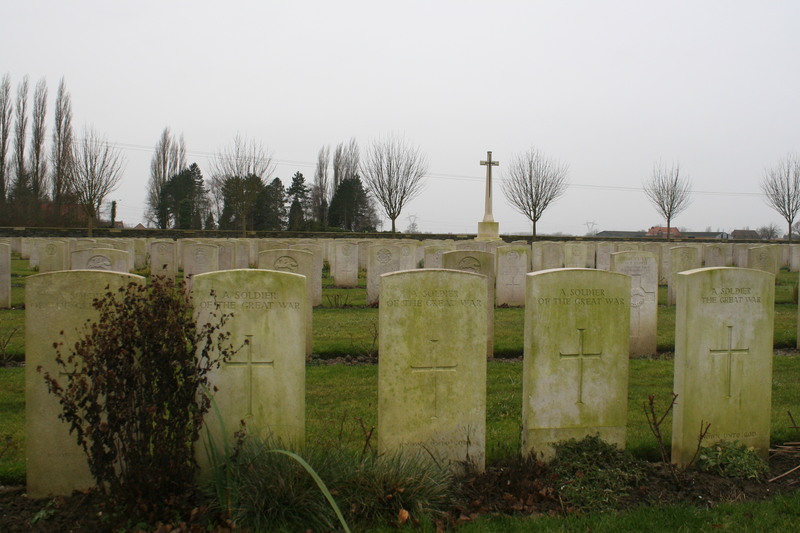 The three men were all killed on the 25.01.1916. 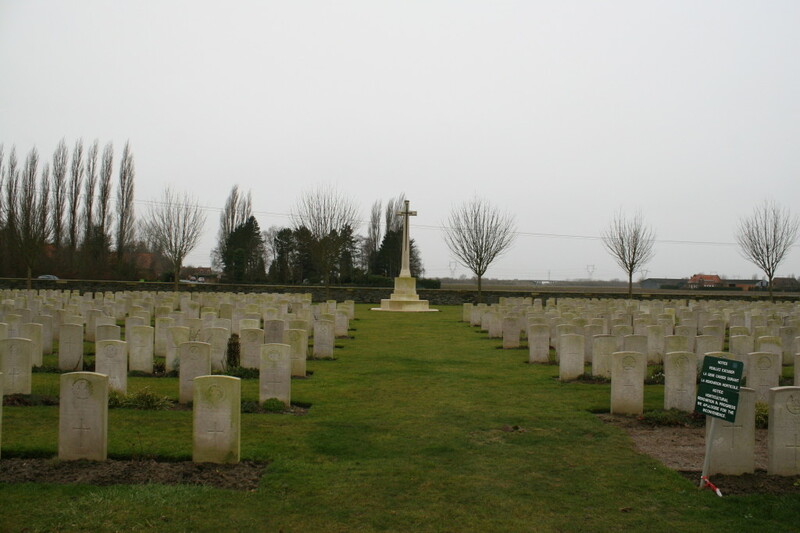 I last visited this cemetery in 1992, the road that passes nearby was so quite then, but is now very busy, also i was the only person in the visitors book, this year it was nearly full! 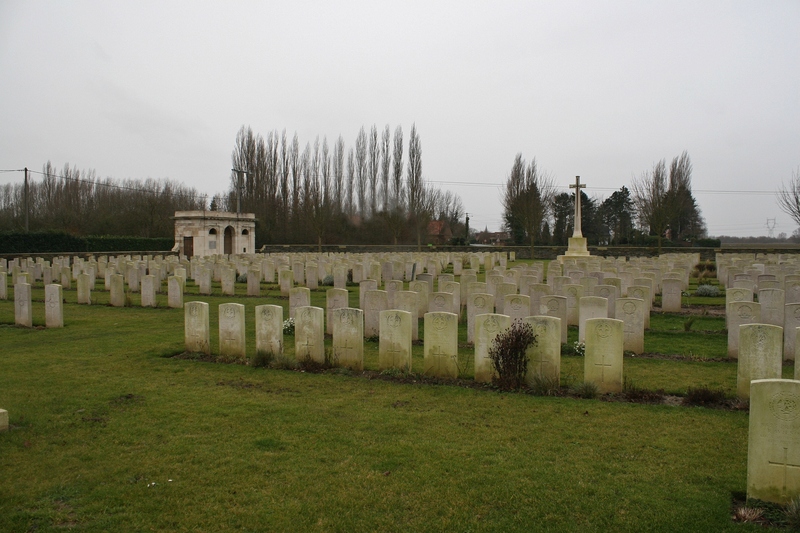 Thanks for your report, also thanks to The Commonwealth War Graves Commission, for maintaining these cemeteries. Hello Keith. Thanks for taking the trouble to comment and for your kind words. I am glad to hear the headstones have had a good clean, and don’t you think it’s wonderful that the cemetery visitors book is nearly full! Let’s hope that remains the case once the centenary is over. i was advised to ask the South staffs museum in Lichfield, they don’t hold any records relating to my query, but adding that a percentage were destroyed in a fire, a friend tried Ancestry, but again, no success. Do you have any knowledge or advice to guide me in the right direction to find out more? Yes, Keith, I do. 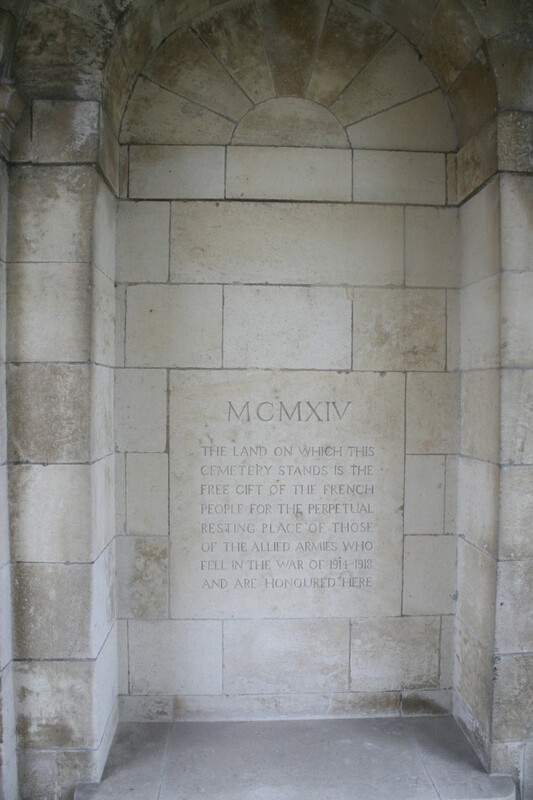 I rather presume that the fire the museum mention would refer to the Great War soldiers’ records held at the National Archives which were bombed by the Luftwaffe and maybe 70% were lost in the subsequent fire. 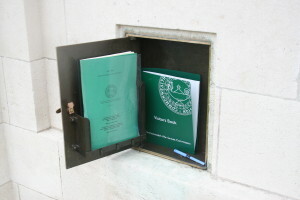 You need to find out if your Grandfather’s papers are among those that survive – you have a reasonable chance. That is the first thing. Check out the National Archives website, and get in touch with them, or even better, visit. From war diaries to pension records, all sorts of other documents may be available. 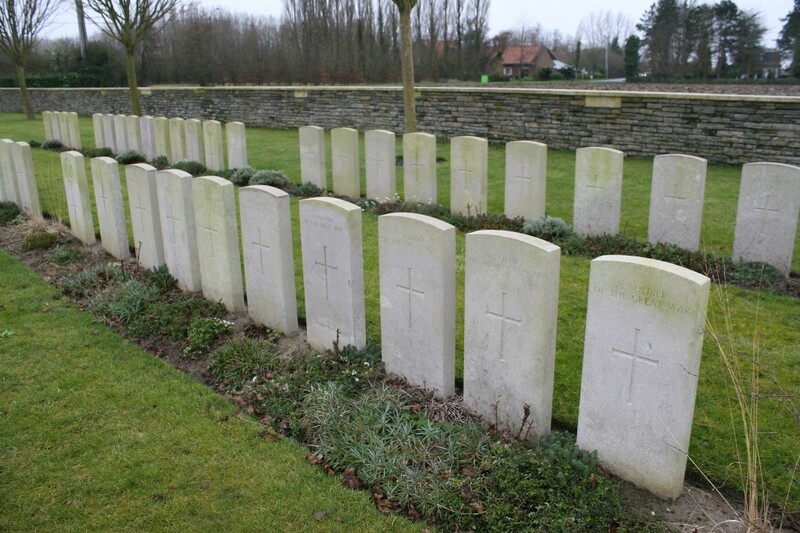 Alternatively, there are people at the Great War Forum who will doubtless help if you ask. Good luck – and let us know, of course!